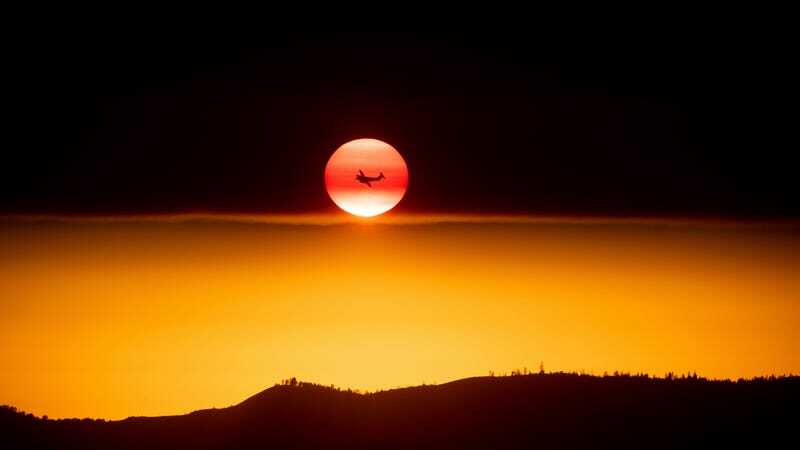 A plane battles the Ferguson fire near Yosemite National Park on July 15th. There’s nothing like a trip to Yosemite National Park to escape the daily horrors of civilization and bask in the stark beauty of nature. Except this is 2018, so of course Yosemite is now shrouded in smoke from a raging, deadly wildfire. The Ferguson fire, which began Friday evening, has swelled to 12,525 acres, threatening rural communities and putting a damper on tourism in and around Yosemite National Park. Fueled by hot, dry weather, the fire is burning on steep and hard-to-access terrain southwest of the park in the Sierra Nevada. As of this morning it was just five percent contained, according to the California Department of Forestry and Fire Protection (Cal Fire). One firefighter lost his life battling the blaze over the weekend, reports the Associated Press. By Tuesday nearly 1,500 personnel had been dispatched to deal with the fire, which Cal Fire says is spreading south and east toward the residences in Jerseydale, Mariposa Pines, Clearing House, and Incline, threatening over 100 homes. A portion of State Route 140 that provides access to Yosemite National Park’s western entrance has been closed since the weekend, and the AP reports nearby businesses that rely on a seasonal influx of tourists are taking a hit. The park isn’t looking so hot, either. Although it remains open, footage from several of Yosemite’s webcams reveals scenic overlooks looking more like Beijing on a bad day. The famous Half Dome rock formation is shrouded in smoke in a time-lapse video released by the Yosemite Conservancy on Monday, while nearby El Capitan wasn’t visible at all from its webcam Tuesday afternoon. The Ferguson fire comes amidst a spate of destructive wildfires that have ignited across northern and central California. Earlier this month, the County Fire lit up explosively in Yolo and Napa counties, consuming 91,000 acres before it was finally contained over the weekend. That blaze, fueled by hot, dry weather and powerful winds, brought back bad memories of last year’s Wine Country Fires, which wound up becoming the most destructive in the state’s history. As more humans live in the path of wildfires and climate change primes western landscapes to burn, devastating fire seasons like this are becoming the new normal. Maybe invest in a flame-proof tent next time you’re planning a camping trip.